Your ads are annoying. If you do not know that then you are a carrot of the highest order, and deserve to be pushed through the bowels of a rabbit with GI stasis. If you are aware that your adverts are annoying, then please rejoin the human race and have a think about how you may make them less annoying. Adverts are not needed when it comes to running a successful website, but they are a way of earning a little passive income and are sometimes the only way a website may make money (as it stands). If you are lucky, then you may make enough to cover your domain and hosting charges. Here is how you make your adverts less annoying without making them less effective. Let’s get this one out of the way from the start because a lot of people out there do not know how advertising works. They think that a person has to look at the advert directly in order to make a sale. They think they need to wave it around the screen, make it flash, have it pop up, and a whole host of other crap. None of this is needed! If an advert is effective, then a person only need see it. They do not need it to flash, it does not need to be the first thing they see, and it doesn’t even need to make an impact on the user. We also have published 20+ Funny and Creative Advertisements to make you laugh and inspire. Do not believe the people who say things about peripheral vision. People are not looking at your adverts on a cinema screen. They are looking at a desktop monitor or a laptop screen, so they do not have peripheral vision. There is nothing in the corner of their eye. If it is on the screen, then they are going to see it. Try some or all of the tricks you see below. More importantly, pay attention to the times when you yourself click on an affiliate advert. You need to be very aware of why you did it because if the website owner is good then you will not even recollect that you clicked on the advert. People expect an advert in the top right hand corner. This is because of Google (of all things). It has taught people to subconsciously look in the top right corner. So, instead of hitting someone over the head with your adverts, just place a nice subtle one in the top right hand corner. This is something that works for a number of reasons. A famous cat food manufacturer launched a successful affiliate advert about why cats knead their beds/surfaces/people with their front paws. The advert was in a YouTube format but put on other websites and showed a video advert for cat food along with lots of footage of cats kneading things. It worked because people recognized the format and because it gained causal interest to the point of having people click on it. This makes it more natural looking and less annoying. It also helps to leak a little bit of your credibility over to your adverts. People feel safer clicking on them because they mistakenly think that your website has something to do with the adverts. It subtly conveys a little more credibility whilst making the adverts less imposing and so less annoying. The things you should not do! Here is a list of some of the things you should not do when installing adverts or creating them. It may seem like a lot of “do not’s” but web masters have found a lot of ways to be annoying. Here is a list of some of the most annoying affiliate advertising ideas and techniques. 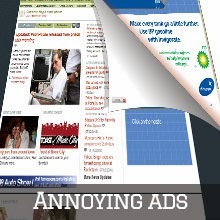 Do you have annoying ads on your website? and if yes then what will you do to make them less annoying?